Although Bali, Indonesia can sometimes have a reputation for being inundated with wild partygoers who run wild, there are plenty of areas where solo female travelers can kick back and enjoy some rest and relaxation. 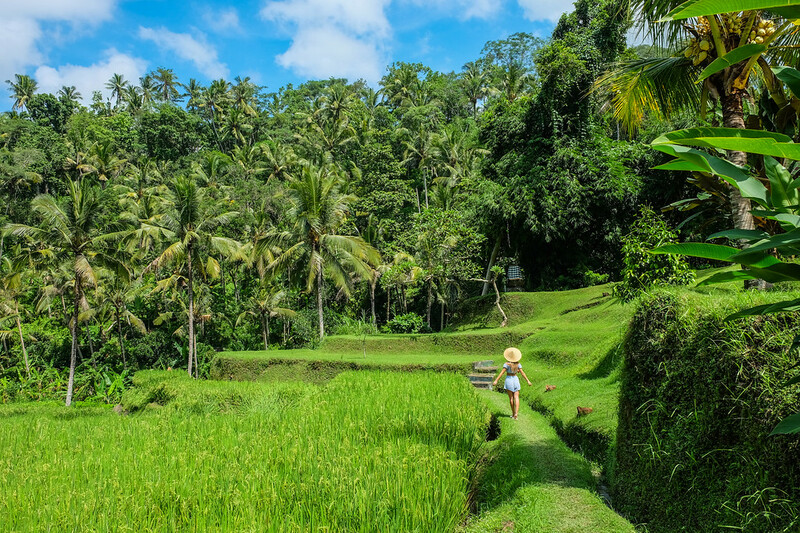 Whether you love to relax by a picturesque beach, enjoy meeting locals and learning the culture, surfing, yoga, or simply wish to laze around at a five-star resort, the island of Bali has you covered. There are many areas in this popular holiday destination where you can avoid the crowds and simply enjoy vacationing in a diverse and laid-back part of the world. Here’s my guide to Bali as a solo female traveler! Bali is home to the most beautiful villas and resorts, available to the budget traveler and the luxury seeker—so there are a lot of accommodation options! My advice is to take advantage of the low price point of Bali and rent a private villa for yourself. Many resorts and villa rental companies offer villas with private pools, exquisite ocean or jungle views, spacious decks, minibars, and comfy couches. These villas give you complete privacy—you can walk around naked without a care in the world… you’ll feel tucked away into nature. Find more of my recommendations in the Ultimate Bali Travel Guide! 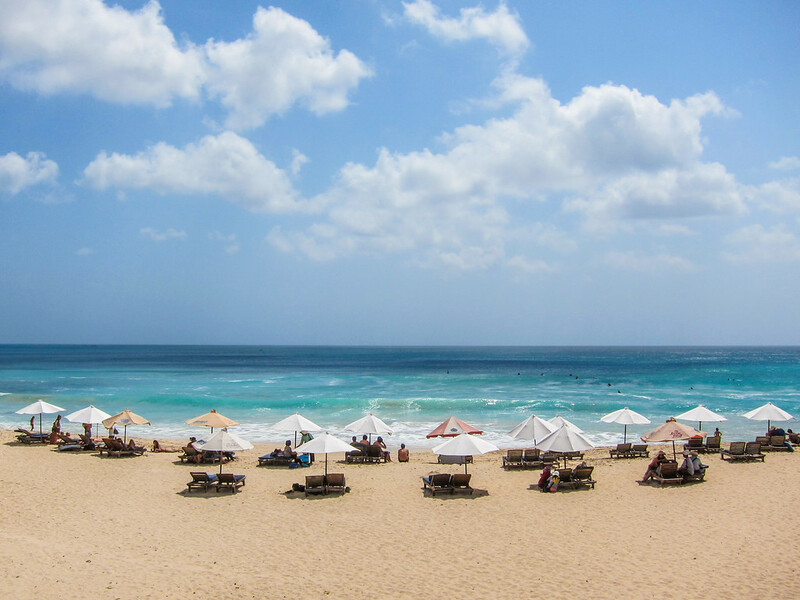 A great way to relax in Bali is by spending time at one of the many luxurious beach clubs spread around the region. Popular clubs like Mrs. Sippy’s and Potato Head Beach Club are located in Seminyak and give you fun swim-up bars, infinity pools, a variety of day beds, and lots of DJs and entertainment. Another top Seminyak beach club is La Plancha, the first in the area to introduce beanbags on the beach. La Plancha has quirky decor, a funky “Spanish meets surfer” style, and fantastic Mediterranean-inspired cuisine for those wanting something to nibble on. On my most recent trip, I visited La Laguna in Canggu, and was blown away by the beautiful beach, amazing sunset, and lively nightlife. There are many ways to take care of your physical, spiritual, and mental health while in Bali. If you’d like to learn how to cook Balinese fare there are a variety of tours you can participate in where you’ll learn about the local way of cooking and dining. Smack-dab in the jungle, Ubud has its fair share of monkeys. But be careful! They are super aggressive. Don’t make contact or interact with the monkeys unless you have bananas. I found the most friendly monkeys at the entrance to the forest where they probably get the most food. For the best photos, walk a bit farther into the forest—you’ll get to a stunningly beautiful temple area. Also highly recommended in Ubud is The Yoga Barn, a place to stretch the body, clear the mind, and take in stunning scenery. The facility provides a large number of yoga classes (many of which are free) in styles such as Iyengar, Hatha, Vinyasa Flow, Pranayama, Power, and Yin. There’s no shortage of beautiful coastline and villa pools to be lounged around in Bali. It’s the perfect place to relax, chill, and soak up some of that wonderful Indonesia sunshine! My recommendation is to avoid the traffic of Bali by renting a scooter—a fast way to zip through the streets and countryside. Renting a motorbike is the “way” of Bali and very cheap. If you don’t feel comfortable driving yourself, you can use the GO-JEK app for an Uber-type service but on the back of a motorbike. Taxis are the most expensive, and Uber is somewhat banned by the a monopoly on taxi service. You can still use Uber, but you need to be very discreet about it and can’t use them to get to and from populated areas. Otherwise, use the Blue Bird app for cab rentals. Read More about Getting Around Bali in the Ultimate Bali Travel Guide! 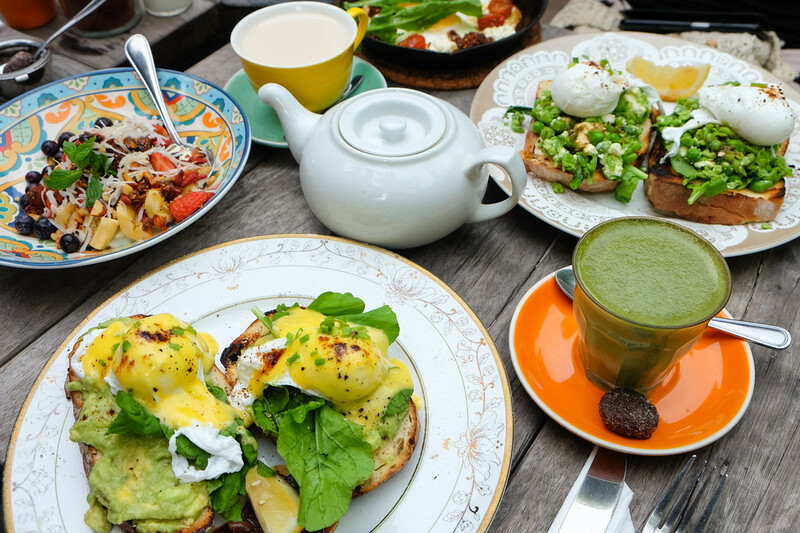 If you’re interested in flying to Bali to sample the fantastic food, you’ll be pleased to know that it is home to an astounding number of amazing restaurants and cafes. Café Organic is very popular with the breakfast crowd and offers amazing food, great coffee, friendly staff, and beautiful decor. I would say it’s my favorite breakfast spot in Bali! Food lovers can head to one of the region’s more recent hotspots, Sundara. 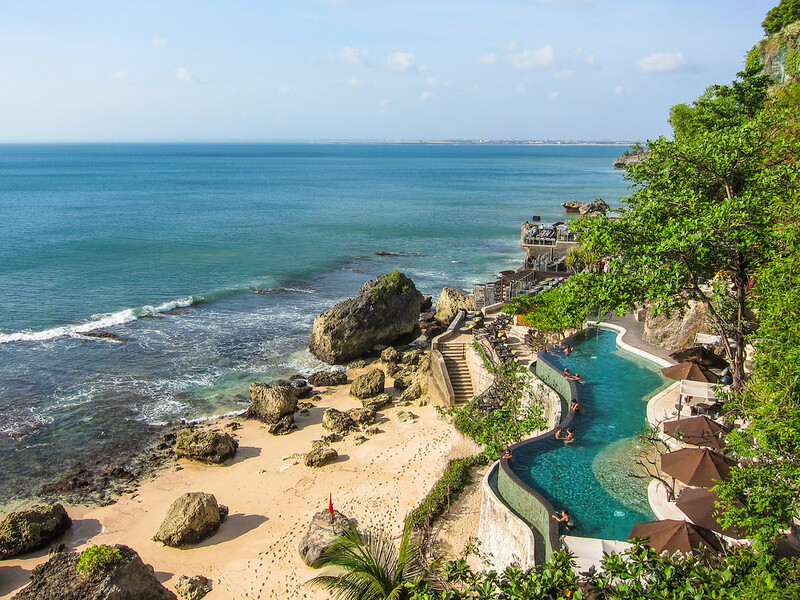 Named after the Sanskrit word for “beautiful,” Sundara is situated in the luxurious Four Seasons at Jimbaran Bay, which is very handy if you’re planning to stay at this five-star resort. Patrons can listen to the sound of the ocean lapping on the nearby beach as they dine, as well as take in the spectacular view of Jimbaran Bay. The restaurant has a beach-club vibe and serves up a variety of international dishes, with a special focus on fresh seafood. 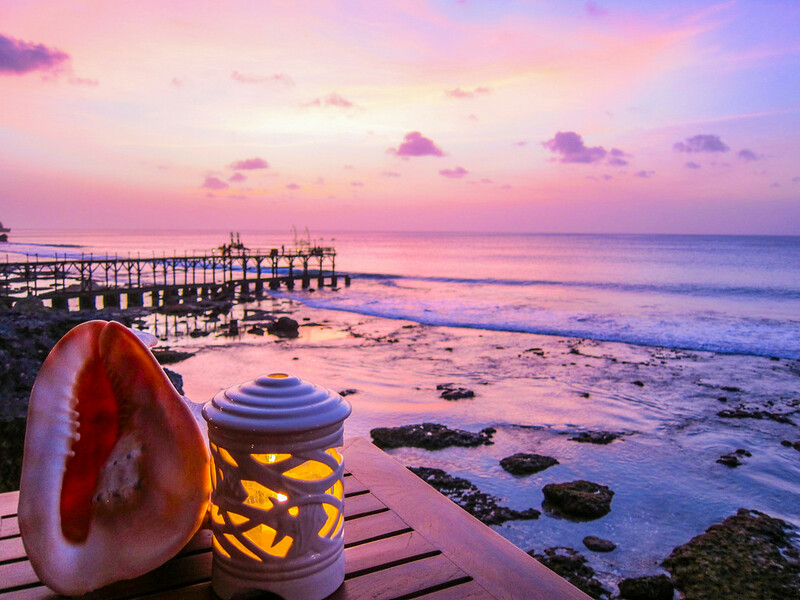 For incredible seafood and a sunset that you’ll never forget, make reservations at Kisik at the Ayana Resort for a sunset dinner. Arrive early for a pre-dinner drink at the cliff-faced Rock Bar. There are often live music artists and DJs that perform here making a fun atmosphere for meeting fellow travelers. For quality meals, make sure you visit the popular Seminyak venue, Ginger Moon. This modern restaurant is spread over two levels and produces dishes that are perfect for sharing between patrons. Those looking to dine on French-inspired cuisine can visit another Seminyak establishment, Petitenget. With a French bistro vibe, the restaurant is popular with locals and tourists alike for long lunches, and stylish dinners. One of my favorite spots in Seminyak for a lazy brunch on a budget is Cafe Bali. Shabby chic decor and a delicious breakfast make the perfect setting for a fresh start to the day. Shop My Favorite Bali Styles! Wow, this is fabulous! Bali sounds like an inviting destination for solo travelers. I would love to have a meal with a view of lush rice-paddies! nice post and very informatif, keep posting. Explore Bali to the fullest !